Country Polo has many steel and copper gags available, such as Barry Gags, Twisted Wire, Rubber Gags, Pelham Gags with double bridle. Some pictured beside. 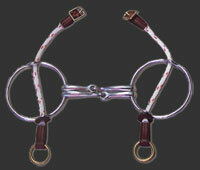 Our specially designed bridles are made from superb quality upper leather with brass buckles. We also stock breast plates, martingales, and all the rest of the gear needed.